Everyone loves a little bag. They’re small but satisfying, always the right size – not to mention, the perfect place to showcase an unusual button (ahem) or a new technique. 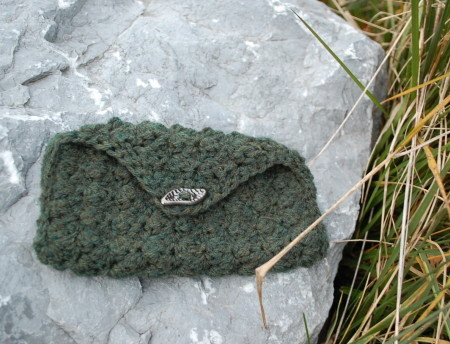 This miniature clutch is worked in a simple repetitive stitch pattern that creates an interesting texture. US G/6 (4.25 mm) or size needed to obtain gauge. Pull up a loop in each of the next 2 sts, yo, pull through all loops. Ch 1, sc dec, ch 2, sk next st, sc dec. (Buttonhole created.) Finish off. To finish, fold bottom corners up to row 22 (where decreases start). Join new yarn at bottom corner (folded corner) and sl st edge closed up to flap. Sc around edge of flap to other side, sl st edge closed to bottom corner. Finish off, weave in ends. Sew on button using buttonhole as guide. Wash and block as needed.